Few things make me more irrationally angry than the news stories that circulate on the Internet every year or so about the supposed health hazards of cell phones and Wi-Fi signals. It seems like there’s no end of studies that are inconclusive–that say, well maybe it causes problems, we can’t really say yet. And there are a few that actually purport to find harmful effects of these signals, up to and including brain cancer. Part of this is a publication bias–studies that don’t find anything interesting are less likely to be published, and when they are, they don’t get as much play in the popular media. This is bad enough by itself. It creates sensational news stories that raise doubts where none should really exist. But some of the problems are far more insidious. 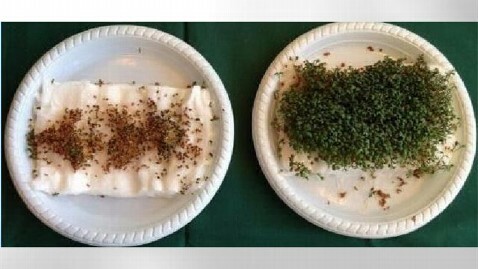 This story is an old one, but it’s been making the rounds again recently, about a Danish 9th grade class that tested the germination of cress seeds placed next to Wi-Fi routers versus those grown away from such signals. In the experiment, the seeds near the routers fared much worse, as illustrated by the picture on the left above, barely sprouting at all while the others were very green. It looks like the seeds were very badly damaged by the Wi-Fi signals, but were they? From the experimental design alone, we can say probably not. This post breaks down the problems with the Danish experiment better than I ever could. The highlights include not paying attention to temperature, not reporting that a second group of seeds with Wi-Fi signals did just fine, and, most egregiously, misrepresenting the results in the above photo to make it look worse than it was. With all due respect to the budding 9th grade scientists, there are serious problems with this experiment that prevent any real conclusions from being drawn. But the real problem goes deeper than this. I think the fundamental error of those who see a link between cell phones and other EMF radiation and cancer is failing to understand that science in medicine and science in physics are done differently. Since we’re worried about health effects, the natural thing to do is to look at the science of medicine. This can be seen in, for example, Congressional panels on the subject that don’t include a single physicist. But you can’t do that blindly on this issue because it mixes the two fields. Science in physics is based on mathematical laws. Science in medicine is based on rules of thumb. If you drop a rock off a 49-meter-tall building, it will always hit the ground in exactly 5 seconds (ignoring air resistance), just because that’s how gravity works. If it doesn’t, you almost certainly did something wrong because if you didn’t, then there’s something wrong with gravity, and you had better go back to basics and think long and hard about what that might be, just like Einstein did. On the other hand, in medicine, if you give the same drug to 10 different patients–or for that matter to the same patient on 10 different days–you’ll get 10 different reactions, and (and here’s the key) you probably won’t fully understand why. We don’t have the basic laws to work from–or at least not in nearly as much detail. Cell phones can not cause cancer. They don’t have enough energy. The laws of physics say that. That means if you run an experiment that says they do, you almost certainly did something wrong, because otherwise, something is seriously wrong with the laws of electromagnetism. This is the problem with the medical studies. They pretty much never postulate a physical mechanism for how cell phone signals could possibly cause cancer. Probably because there isn’t one. Under the laws of physics as we understand them, such an explanation does not exist. Edit, May 8, 2018: Years after I wrote this, I had a brainwave about this quote, and I wanted to correct it, especially since this remains my most-read post. The original quote wasn’t about cell phones at all. It actually came from the book Strange Matters by Tom Siegfried and addressed whether a particle accelerator could destroy the world by creating…well, strange matter. The quote was this: “[W]orrying about strangelets is like fearing your dog’ll bite you to death, when your dog has no teeth, and you don’t even have a dog.” I still believe the sentiment is valid regarding cell phones causing cancer, though. The bottom line is this. If anyone ever managed to produce clear and convincing evidence that cell phones and Wi-Fi signals caused cancer or any other serious health effects, then we would have to go back to the drawing board and seriously rethink the laws of particle physics and run lots of new experiments down at the chemical and molecular levels to figure out just how electromagnetic signals that weak can possibly damage cells. Until and unless such a thing occurs, I’m not worrying about my wireless. This entry was posted in Debunking and tagged bad science, cell phones, debunking, health effects, pseudoscience, wi-fi and plants. Bookmark the permalink.